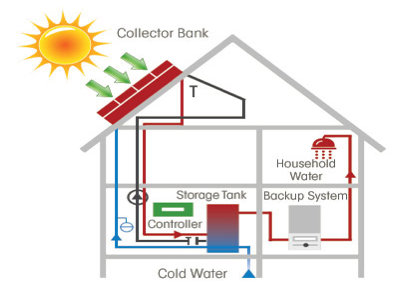 Most solar water-heating systems for homes have two main parts: a solar collector and a storage tank. The most common collector is called a flat-plate collector. Mounted on the roof or on a ground rack, it consists of a thin, flat, insulated, rectangular box with a transparent cover that faces the sun. Small tubes run through the box and carry the fluid, water with an antifreeze solution, to be heated. The tubes are attached to an absorber plate, which is painted black to absorb the heat. As heat builds up in the collector, it heats the fluid passing through the tubes. The solar panels are typically 4’ wide by 8’-10’ high. The storage tank, which should be well insulated, contains a coiled pipe heat exchanger which serves two purposes. It separates the antifreeze solution from the potable water in the storage tank and transfers the heat from the hot antifreeze solution to the potable water inside the tank. 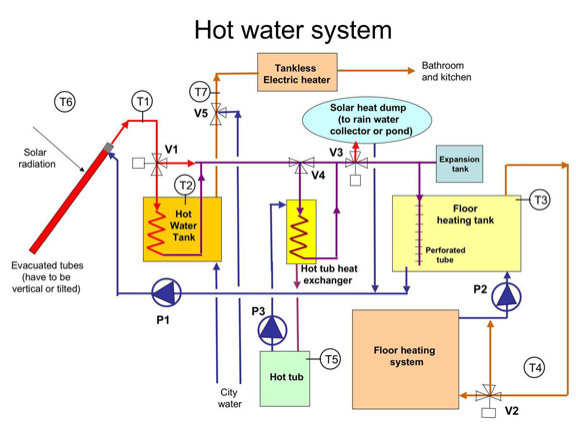 The storage tank is connected to the cold water supply system and the household hot water heater, and preheats the cold water before it is piped into the hot water heater. The other components of the system include a pump to pump the antifreeze solution between the solar panels and the heat exchanger in the storage tank, a check valve to keep the hot antifreeze solution from siphoning back into the cool solar panels at night, mixing valves, and temperature sensors in the storage tank and inside the solar panel that control the pump, turning it on when the solar panel temperature is higher than the storage tank temperature. An expansion tank and pressure relief valve protect the system from excess pressure caused by high temperatures. The solar panels can be placed on the roof of the house or an accessory building with enough roof area. The structure of the roof should be checked to be sure it can support the dead weight of the solar panels. They can also be installed on a rack secured to the ground. The panels should not be located too far from the home since some efficiency is lost to underground piping from the panels to the house. The panels are installed facing south, at a steep angle, at least 55 degrees, to maximize solar gain of the low angle winter sun, and also minimize the solar gain of the high angle summer sun, since there is a much reduced demand for hot water in the summer. Typically, the system is sized for the summer hot water requirements to keep the system from overheating in the summer. The system will provide 100% of summer hot water needs and about 40% of the winter hot water requirements. Mixing valves are used to prevent scalding. T he energy of the sun can be harnessed to heat water for domestic hot water, bathing, laundry, etc., and also for space heating, such as radiant floor heat, which does not require high water temperatures. For domestic hot water, a typical family of four will use about 120 gallons of hot water per day. In this case, the storage tank should be 120 gallons to provide enough hot water storage after sunset. Taking into account the average solar energy available in Maryland, we will need a minimum of one square foot of solar panel to heat 1.5 gallons of water. For our family of four we will need a minimum of 120 gallons of hot water which means we will need 80 sf of solar panel to capture enough of the sun’s energy (120 gallons divided by 1.5 gallons equals 80 sf). Two 4’ x 10’ solar panels should do the trick. There are two ways to use the hot water generated by the solar panels for space heating. The most efficient requires a hot water radiant floor heat system be in place. Hot water from the solar panels is provided through a heat exchanger to the radiant floor system. The second method provides hot water to a heat exchanger installed in the return duct of a forced air heating system. More solar panels will be necessary for space heating. In Maryland, you will need about 2 sf of solar panel to heat 10 sf of living area. A 2000 sf home will need 400 sf of solar panel, or five 8’ x 10’ solar panels. 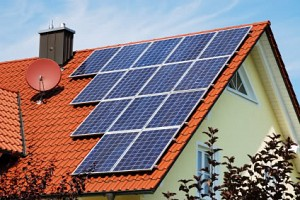 Since each home has unique circumstances, you will need to contact a reputable solar company to calculate the size of the system depending on your needs. 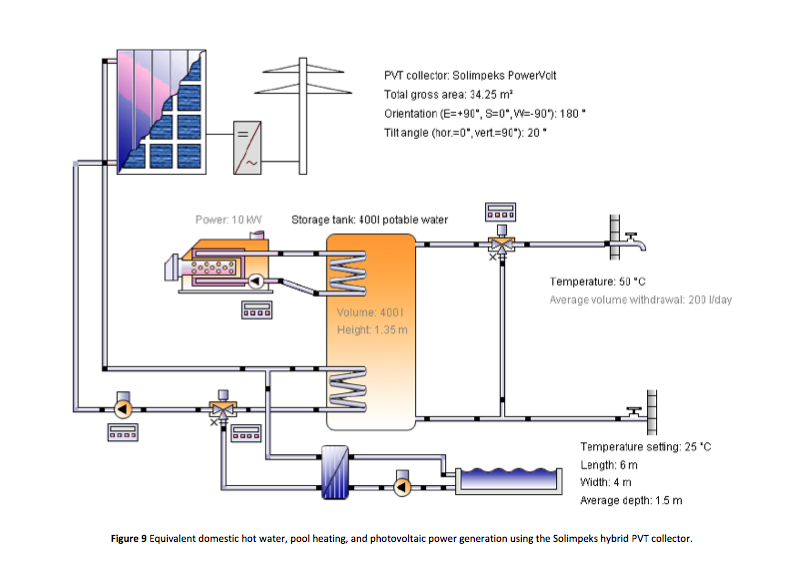 IS SOLAR THERMAL A GOOD INVESTMENT? There is some disagreement as to the efficiency of using solar heated water due to the difference in the time the heat is generated, during the day, and when the hot water is needed, typically more at night, especially for space heating in the winter. The way around this dilemma is to use a large water storage tank, 250-500 gallons, to store the heat generated during the day by the solar panels. Two heat exchange coils, one for domestic hot water and one for space heating, are placed inside the storage tank. During the day, the solar panels will heat the water in the storage tank up to 130- 140 degrees. A portion of the heated water can be used for domestic hot water and the balance can be used for space heating. A 500 gallon storage tank will supply enough hot water for one night and one half of a day for a home with about 2000 sf of living area. The radiant floor heat only requires 90-100 degree hot water for space heating. The down side is that when the skies are cloudy, there will not be enough solar energy to heat up the water in the storage tank. 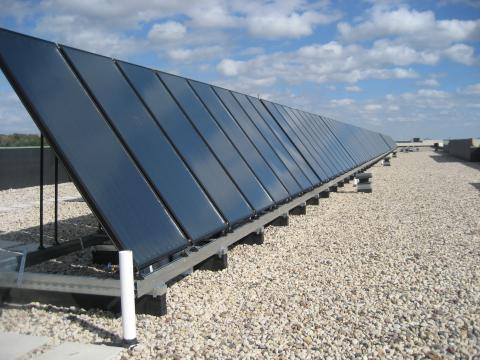 As a result, solar space heating will only meet about 25-40% of your heating needs. You can gain some efficiency in the summertime if you have a pool, which can be heated with excess heat produced by the solar thermal panels. The solar thermal systems have a life expectancy of about 25 years. Some components may need to be replaced over time, for example the water pump, and the antifreeze solution will have to be replaced about every five years. Otherwise, there should not be a lot of maintenance costs. 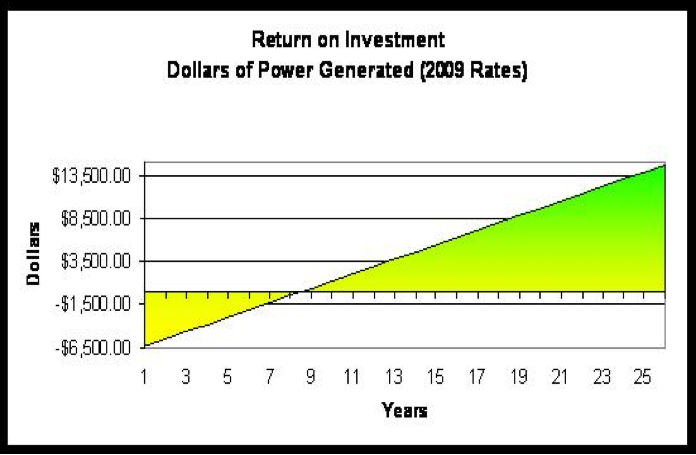 So, what is the return on investment for solar thermal? A two panel system with storage tank, for domestic hot water only, will cost approximately $7,000. A seven panel system with larger storage tank, for domestic hot water and space heating, will cost approximately $24,000. In both cases, it will take about 10 years, using today’s cost of energy and a 30% federal tax credit deducted from the cost, to pay for the solar thermal system. After that, you can bank your savings while you help improve the environment. The newest solar panel, called a photovoltaic thermal hybrid panel (PVT), combines a photovoltaic with a solar thermal panel. The photovoltaic panel is on top with the solar thermal panel on the bottom. The photovoltaic panel generates heat which can be used by the solar thermal panel to heat hot water for use in the home, making the hybrid panel much more efficient since it makes good use of what used to be a waste product, heat, generated by the photovoltaic panel. Even better, the photovoltaic panel can generate more electricity when excess heat is removed by the solar thermal pane. I would say things are looking up for renewable energy resources, especially as the powers that be, and the populace in general, begin to realize the extremely high cost to correct environmental problems caused by the use of fossil fuels. When you look at it this way, solar energy looks like a bargain.